AFTER SUFFERING A life threatening injury, some farmers face a long struggle just to re-establish a normal life, but those determined to get back to the business of farming face an even tougher road. A new program aims to help them with that. PHOTO: BOB GUEST, CHAIR OF CANADIAN FARMERS WITH DISABILITIES. The ‘Back to Ag’ program will be administered by the Canadian Agricultural Safety Association (CASA), in an effort to help producers who have suffered serious injuries re-equip their farm so they can get back to work. The program will officially launch on October 8 this year, granting as much as $10,000 per applicant towards adaptive technology like machinery adaptations, medical devices, farm building renovations, and other purchases that may be required to make a farm more accessible. CASA’s executive director and former pork producer, Marcel Hacault, says their program aims to help farmers bridge the gap between simply becoming independent once more and productively contributing to a farming operation. Aware of a similar program in the United States, known as AgrAbility, Hacault says they consulted their program administrators while designing this version for Canadian farmers. Bob Guest, chair of Canadian Farmers with Disabilities, was also consulted through the process. When he lost his arm over 50 years ago, he says there wasn’t the support or the technology available that there is today. “We have the technology and the knowledge out there with the GPS, self-steering, and the lifts we’ve developed through Disabled Farmers that, if the guy wants to seriously get back on the farm, then we need to help him live a full life,” says Guest. He is pleased the program criteria has been kept flexible, so every individual can tailor it to meet their own needs, because he says every injury is different and overcoming it is too since every farm operation is unique. Applicants to the Back to Ag program need to be Canadian citizens, 18 or older, with the intention of returning to work on the farm. They must show their need for the adaptive technology and demonstrate how the adaptations will help them return to work. Many farmers with disabilities face increasing challenges such as this all the time, he says, which means even those with old injuries can suddenly find themselves impaired in new ways. He really likes that this program will allow these farmers to get help even as their injuries evolve or worsen, allowing someone like him to purchase a hands-free computer someday if he no longer has even one useable arm so he could still help with paperwork. “Regrettably, we can only help a small number to start off with,” says Guest. Thanks to the combined efforts of Farm Credit Canada and the Rick Hansen Foundation, $100,000 was donated to kick start the program this past June; but the high cost of adaptive technologies will limit how far that money can stretch. To the surprise of everyone involved however, the awareness campaign that circulated through social media has sparked some additional offers of funding from small communities and fundraising organizations. 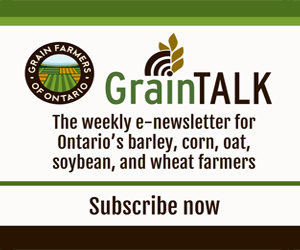 Mike Tomascin, the Ontario director for Canadian Farmers with Disabilities, says this is exactly the sort of increased awareness and support farmers in this province need. Tomascin says before most injured farmers even think about asking for money to start adapting their farms, they question if they even can get back to work. Very few know Farmers with Disabilities is available to help and that they will send a similarly injured farmer to their hospital room to talk about overcoming their injury. The fact that Rick Hansen became involved is very uplifting for Tomascin. He says it can be frustrating when he reads in the paper about another farmer who caught their hand in a combine like he did, but he can’t offer peer counselling, can’t offer any words of encouragement, unless the organization gets called in. Marcel Hacault, executive director for the Canadian Agricultural Safety Association (CASA), says their mandate is to have a Canada where no one is hurt farming, “but despite all our best efforts, sometimes injuries occur.” To stop accidents from happening on the farm, he recommends risk assessments as the ultimate injury prevention tool. Remember, equipment should be assessed on any hazards it might pose, and thinking about personal protective equipment should be part of the routine when it comes to chemical use on the farm. After an injury, risk assessments should be a part of keeping safe on the farm. Training everyone on the farm how to deal with and operate equipment that has been modified is part of this risk assessment.